I’ve talked about “dumping milk” before from cows that have been treated with antibiotics or have milk that is otherwise unfit to sell. Some people still seem to be unclear about what dumping milk means. So I took photos. Hope it clears up any misconceptions about what dumping milk means. This cow is a cow that has been treated for mastitis with antibiotics. Because her milk isn’t fit for sale until her treatment is done and the milk is tested to be free of any remaining antibiotics we have her marked with red leg bands. The red leg bands tell us to milk her into the “dump bucket”. 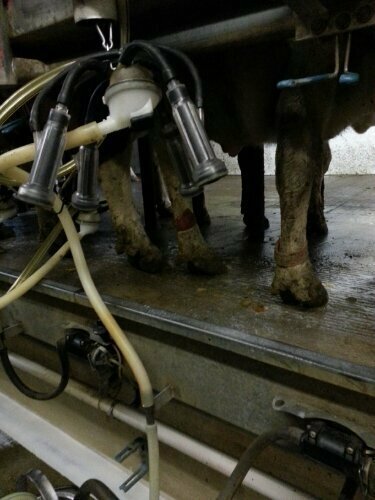 Here you can see what the dump bucket looks like when it is hooked up in the milking parlor. Only the treated cow has the white bucket. The other cow’s milk goes into the regular milk pipeline. 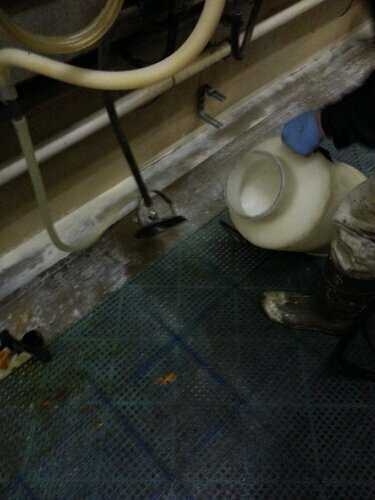 The bucket holds the milk from the treated cow so it can’t enter the bulk tank. My husband has big feet…. After the cow is done milking we take the lid off of the bucket and we…..
No use crying over dumped milk. We dump out milk from antibiotic treated cows because it’s the right thing to do. The average cow in our herd milks 80 something pounds of milk every day. So dumping her milk out costs us about $12-15 every day. While the cost of dumping out milk can add up, $15 is nothing compared to the cost of having to dump out an entire semi load of milk if we did screw up and send milk from a treated cow. Every cow is tested before she goes into the tank. 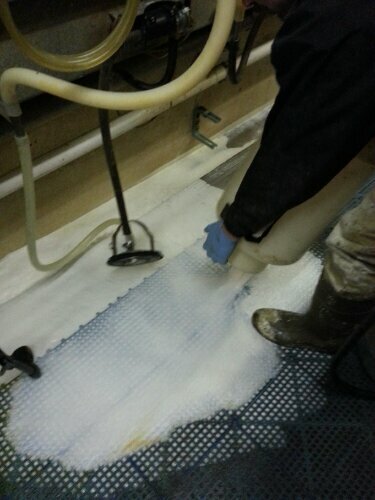 Every tank is tested when it is picked up and every truck load of milk is tested at the dairy plant. The milk that is dumped out in the parlor goes into a holding tank with the rest of the water we use in the parlor and is eventually hauled out to our fields and returned back to the soil where it started. Is Chocolate milk made from bloody milk? « Is Chocolate milk made from bloody milk? 39 Comments on Dumping Milk. You could offer that milk to other animals or something instead. :O Seems like such a waste, even if there are traces of antibiotics in it! The cats do enjoy some of the milk but we feed our calves milk replacer because we don’t have an on farm pasteurizer. It doesn’t go to total waste because the soil it gets spread on uses it as fertilizer. I’d heard the term “milk dumping” before and was wondering if I could take it literally. Now I know that I can. I was pleased to hear that those nutrients are returned to field to nourish future cow feed. Thanks for walking us through this process. Nice post! I’ve actually never seen a bucket like that. We milk colostrum into a stainless steel bucket, but we separate our treated cows and milk them through the pipeline directly into the drain. Other than a bucket that we fill for the cats, of course. We have a stainless bucket for fresh cow’s colostrum. But the plastic bucket works well since we have separate groups of cows and they come in at different times. I think you need a better word than colostrum. I have no clue what it means, but it sounds vaguely sinister. I’ve never learned any dairy nomenclature because my family produces free range grass fed beef… any dairy we produce goes right into the veal (just kidding, we don’t raise veal). Anyway, colostrum sounds way too close to colostomy, which is a foul but sometimes medically necessary bypass of the lower intestines, and when you say ‘fresh cow’s colostrum’, there’s half a microsecond of a moment there where apples=oranges and colostrum=colostomy and for half a moment more I think that it might be a good thing that I don’t know jack about how my beloved, whole, homogenized, vitamin D beverage of choice gets to me. William, colostrum is not my word. It is the correct term for a mammal’s first milk. You mention that your family has cows, maybe you should spend some more time with them. It’s kind of obvious that their experience with cattle has not been transmitted via your genetics. More interesting facts about dairies and what they can..and cannot do. Thanks for this! I grew up on a dairy and still live on a farm. 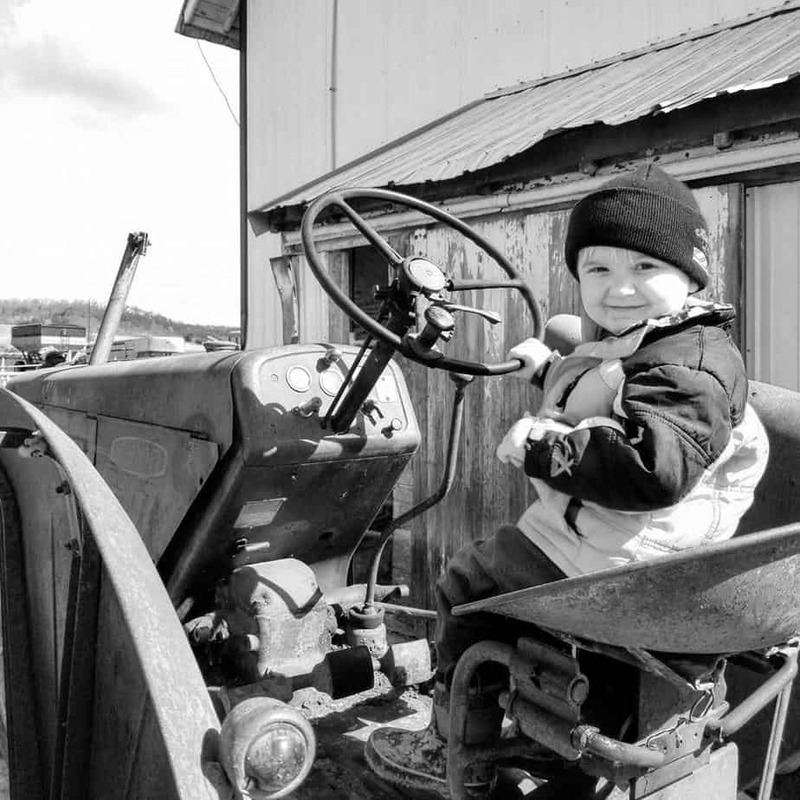 I never realized how misinformed the general public is about this and other farm related topics until I started looking at “mommy” websites after the birth of my son. The ignorance that exists is mind boggling. In addition I believe the more removed society becomes from our food sources, the more we see a lack of empathy. When you care for the earth and you care for animals you also care for your fellow man. Thanks for taking the time to comment. Yes the disconnect between food and farm is growing wider every day. It’s important for us all to share our knowledge! This is a great post & pictures – hopefully people who have questions and are searching for answers will find this and in turn be more informed! Thanks for stopping by! I love Jersey cows 🙂 Every tank of milk is tested for bacteria and other milk quality factors as well as antibiotics. In addition to that every semi load of milk is also tested for antibiotics. I don’t know that you can dilute antibiotics enough to not show up on the test. Our on farm test that we use to test any cow that has been treated is very sensitive. I can only imagine how sensitive the tests are in the actual dairy lab. We have had it happen twice before where a cow was supposed to be dumped went into the big tank. Even though they were close to being ok to go into the tank again, our on farm test was sensitive enough that when we tested the whole tank it came back positive and we dumped out the whole tank. Milk cooperatives have procedures in place to encourage farmers to dump out suspect tanks before they go onto the big truck. Our cooperative will even cover 80% of the cost if you have to dump out the whole bulk tank. If the whole semi has to be dumped because you didn’t stop it from going on the truck you are out the money for not just your tank but all the milk on the semi. Pretty good incentive to not mess around! I am new to your blog. Love it! Please do not be offended by my questions! But….here it goes…. 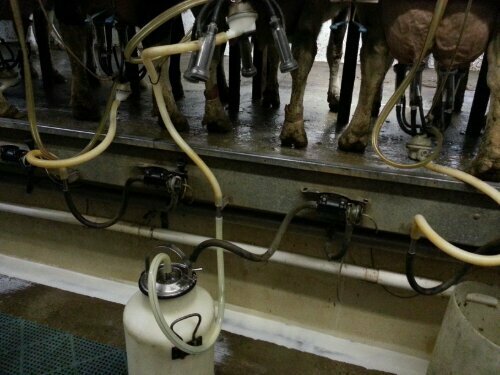 Is this how it is done on every dairy farm? All states? All brands of milk? No medication allowed in milk sold on store shelves….no antibiotics, no artificially introduced growth hormones or steroids? Nothing added to feed in form of drugs or growth boosters or milk production boosters? Are the cows fed any grass at all or just grain? I really want to hear about this from the sources. I am into organic food because I do not like pesticides in my produce or in my food and i am still not convinced GMO’s are safe. I like my local, smaller scale farmers. It is not practical to get everything I eat in this manner though. I am a nurse and know all about antibiotic resistance due to overuse of antibiotics….by doctors over prescribing to patients that don’t need them, but also by the massive amounts used in animals for food production. From what I see of your farm, you are to be commended for being a wonderful part of our countries dairy farmers that do it the right and ethical way. I fear that not all farmers are like this. I really do pay attention to where my food comes from. I hate waste. But I also hate unhealthy things going into my body and drugs of any kind…that I don’t know I am ingesting…. scare me. Steroids and hormones especially. I love milk. I love meat….but not chemicals and drugs. Thanks for this blog! I am a new follower! Thank you for following and for taking the time to comment and ask me questions. I think you will find that I am not out here to convert anyone to my way of thinking but instead to provide a realistic viewpoint of what really happens on farms. Lots of questions here, sorry if I miss one… To answer yes, all milk, all brands, all kinds, all farms are tested for antibiotics. The only way a person could buy milk that hadn’t been tested for antibiotics is if they are buying raw milk off the farm. Which in many states is illegal. As far as being worried about hormones, I can say that rBGH is so similar to the hormones that are naturally occurring in milk that it is completely undetectable and are not absorbed by the human body. However if you are worried about extra hormones just take a look at the gallons of milk in the store, many will be labeled as rBST/BGH free. Many milk companies will only accept milk from farmers who have signed a pledge to not use BGH on their cows. You mention that you are wary of pesticides on your fruit and vegetables and so you buy organic, please remember that organic producers also use pesticides but they are formulated different than the pesticides that conventional farmers can use. The safest way is to but what you like and take it home and wash it! I hear a lot of talk about overuse of antibiotics in animals. Lots of times I see people quoting that farmers use 10 times the antibiotics on animals that humans use… Since you are a nurse I am sure you can guess why that is… cows are 10 times bigger than humans! Of course we use more. Scale is important to remember! I hope my explanation helps. 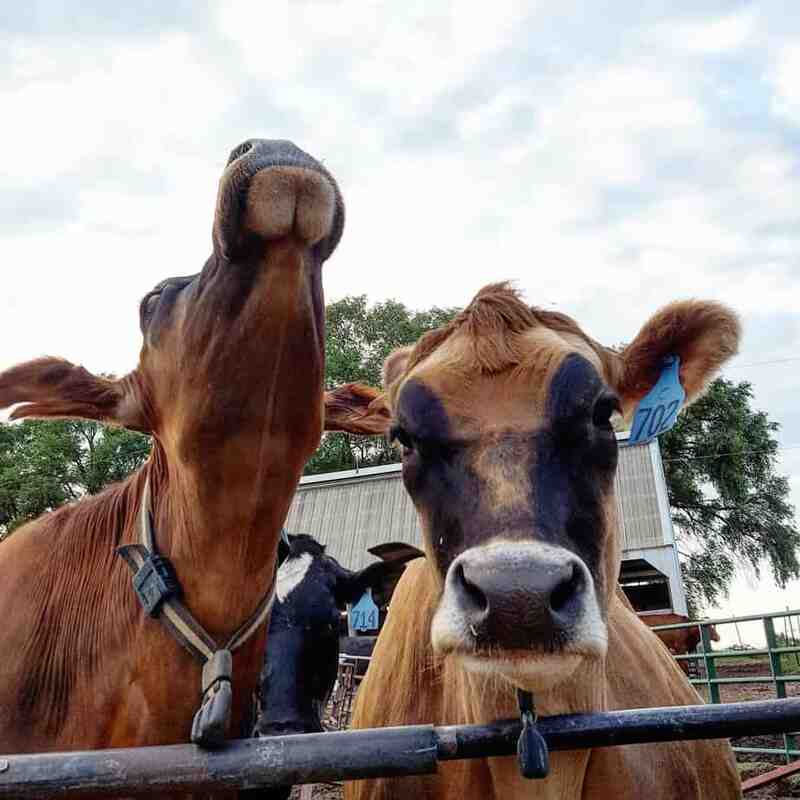 I just posted a link on the Dairy Carrie facebook page that compares hormones in meat to other foods we eat and I think you might find that interesting so please go check it out! Laurie, here’s something to think about: I’ve got big concerns about GMO’d food, especially corn and wheat products that are now capable of laughing at roundup and capable of secreting pesticides. However, the other evening I heard Neal DeGrasse Tyson weighing in on the pros vs. cons of playing with the genetics of our food, and he made a valid and enlightening point that I never really considered, but that’s why I love Neil DeGrasse Tyson, he sees science in such a unique and brilliantly simple way. He basically pointed out that the foods that we’ve been eating for thousands of years are all GMO. Except for what comes from the deep ocean, there is no such thing as an unmodified food product. We’ve used eugenics since before the dawn of modern history to create farm animals that make more tasty milk, more wool, tastier meat, more literal horsepower, better resistance to disease. There’s no such thing as a wild cow, and probably never was. 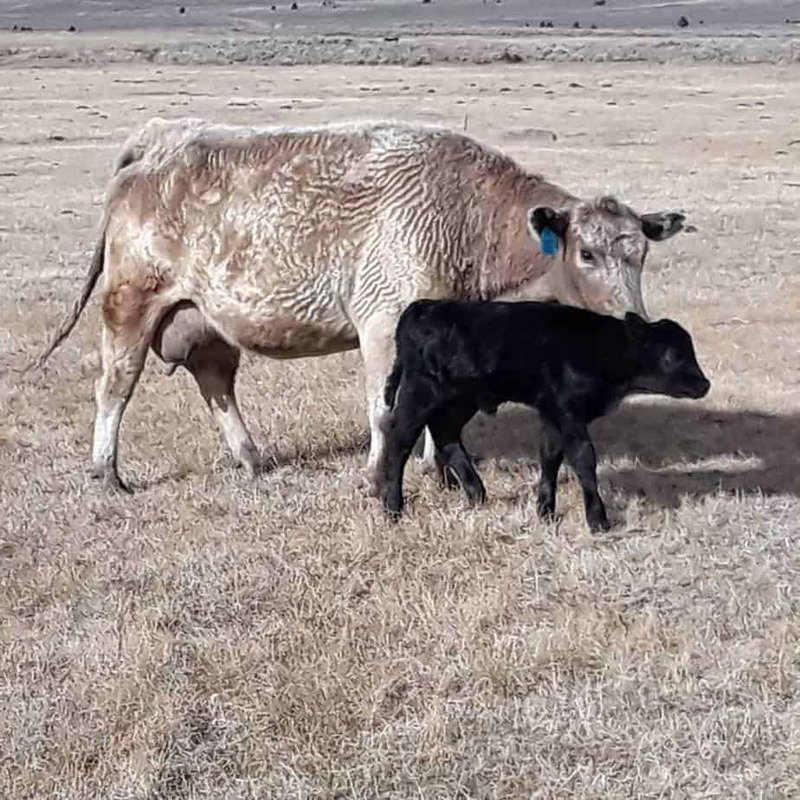 The first cow in the typical sense was probably bred into existence from water buffalo or oxen, and they in turn were probably bred from wildebeest more than 10,000 years ago. All the fruit you eat has had it’s ability to reproduce bred right out of it. You can’t just eat a peach and put the pit in the ground and get a peach tree. You need to clone a peach tree by taking a peach branch from an established tree and graft it to a compatible sapling of a tree that CAN be grown from a seed. William, you’re full of interesting comments tonight. You might want to take some time and read up on GMOs. You’ll be surprised to learn that there is no GMO wheat available. It simply isn’t a crop that is available with any GMO traits. Thanks so much. I see I posted under someone else and not properly…oops! I understand the organic label and its limitations and what it means and does not mean. I understand the antibiotic use on much larger animals vs us little humans. I feel antibiotics for humans are way, way overused. I do buy the milk that is free of artificial/synthetic hormones. I get laughs at a lot of silly stuff posted by anti-dairy, anti-ag sites. I have a philosophy that what I eat should be as near to the way God made it as it can be. Looking forward to following you! I am from Iowa…not a farm girl but right in the middle of farm country. I actually spoke out on a site where everyone kept saying “milk allergy” for every single problem people asked questions about..Things from asthma to every little skin blemish or rash, a loose stool once in a while, fussiness. I was getting sick of it and gave my medical opinion, backed with facts and I was booted from the group! Anyway, happy milking to you all. Thanks for your hard work! No worries on where it is posted, I don’t really care! Just glad you posted! Thank you for standing up against the misinformation that is out there… sometimes it seems like it’s the trendy new thing to have an ax to grind with farmers or foods for no real reason. Have a great weekend! Thank you for this! I am just discovering your blog and it is so interesting. I really am starting to question my need to buy organic milk, which costs so much. I really appreciate you answering these questions! Happy to do so Jennifer! I personally have nothing against organic milk and have some great friends that are organic farmers. 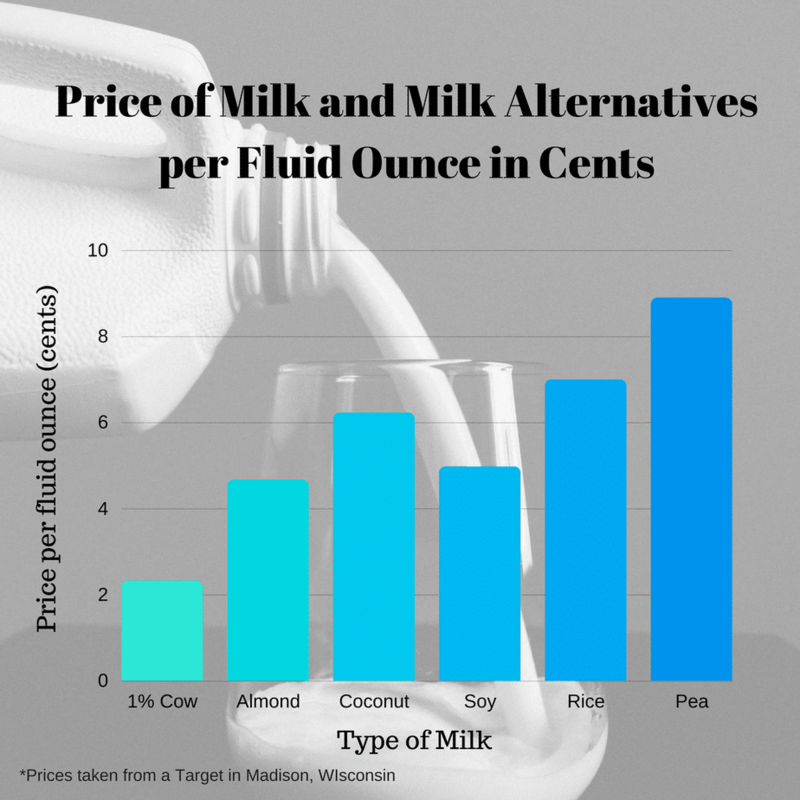 However, I personally think that conventional milk is great and often misunderstood. Ask away! Thank you so much for clarifying this for people. I raise dairy goats. I have a real problem with people who think that dairy animals should never ever get antibiotics. Obviously they have never seen a nasty case of mastitis or infections following birthing problems…. Thanks for this interesting blog. What happens to colostrum? As a kid I lived on a sheep farm and we used to get cows colostrum for poorly lambs. I was under the impression it was a waste product for the dairy farmer. Colostrum is super important to our newborn calves. They need a gallon of it is the first 12 hours of life to build a healthy immune system. We milk or fresh cows into a special stainless steel bucket, test the colostrum quality and feed the best of it to the calves. 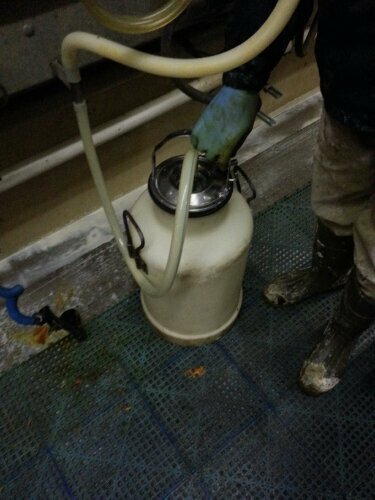 We also freeze the high quality colostrum for calves that come from cow’s that don’t have enough or good enough quality. 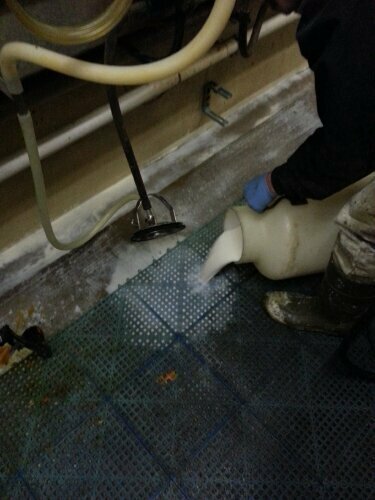 The colostrum that doesn’t meet our quality standards is dumped. Thanks so much for your answer Carrie. Clears up my fuzzy memory from when I was a kid. Perhaps we were given the colostrum that didn’t meet quality standards for the lambs. On average, how long do the antibiotics stay in the cow’s system? How many days do you have to throw away the milk? It depends on the type of antibiotic. Some have a 36 hour milk hold and some have a 7 day milk hold. Each one is tested to determine how long it takes to be metabolized by the cow.